The buzz over the last couple of days has been about Facebook’s Surround 360 camera, which takes 360-degree videos in 3D with 8k resolution. But it is huge and costs an eye-watering $30,000. Fortunately, 360 3D capture is not beyond consumers’ reach. The Vuze Camera captures 360-degree videos in 3D with 4k resolution, is compact, and costs under $1,000, and it is now available for preorder. 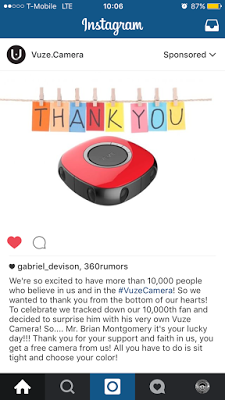 ​When the Vuze was first announced, they said the price would be “under $1,000.” That’s not chump change but it’s a fraction of the cost of other 360-degree 3D cameras such as the Surround 360, or the GoPro Odyssey / Google Jump ($15,000). The good news is that preorders for the Vuze will cost only $799, including the Vuze Studio software, the Homido-designed VR headset, and the VR Minipod (tripod / selfie-stick). Here is the preorder link. If you’re interested, I would not wait too long. Why? First, more than 10,000 people have already signed up for Vuze’s website. Unless you already signed up, they found out about the preorder before you did. Vuze orders will ship October 2016, although they will ship in the order that they receive orders. I ordered one too and will post a review when I get it. 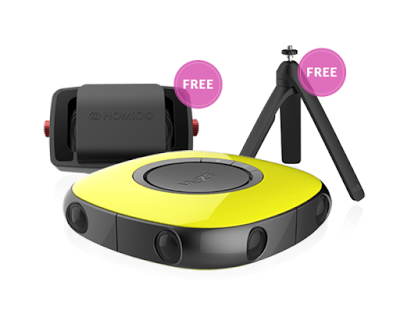 In the meantime, check out these related posts, including sample 3D 360 videos from the Vuze.